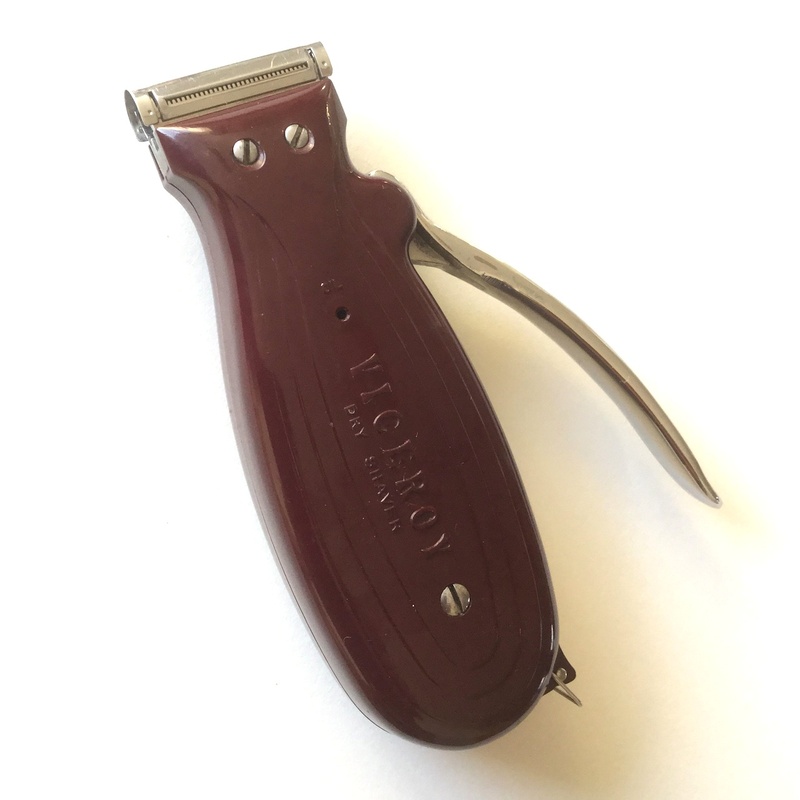 The Rolls Razor company filed patents for this dry shaver around 1937. Evidenced from mention in advertising directories, the company launched this product onto the British market in 1939. 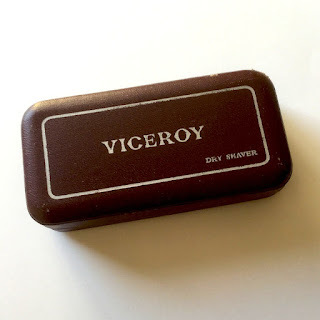 It was manufactured essentially unchanged into the 1950-ies. This specimen with serial number K069535 probably was manufactured in 1953, judging from the year code on the cutting-element (as per Rolls Razor standard practice). 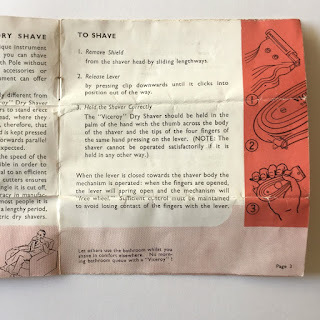 Good thing to have the instructions - who knows what this dry shaver would've been blamed for otherwise! 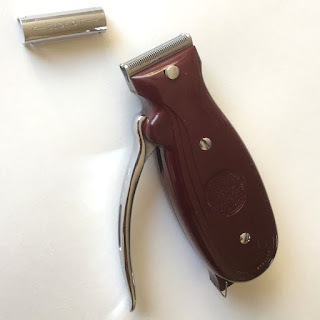 The shaver with the handle unlatched. The cutting elements come out for cleaning. The only thing missing from the set is the original cleaning brush. Perhaps that's just as well. All these parts were rather gross and dirty as can be imagined. All carefully cleaned and disinfected with alcohol. 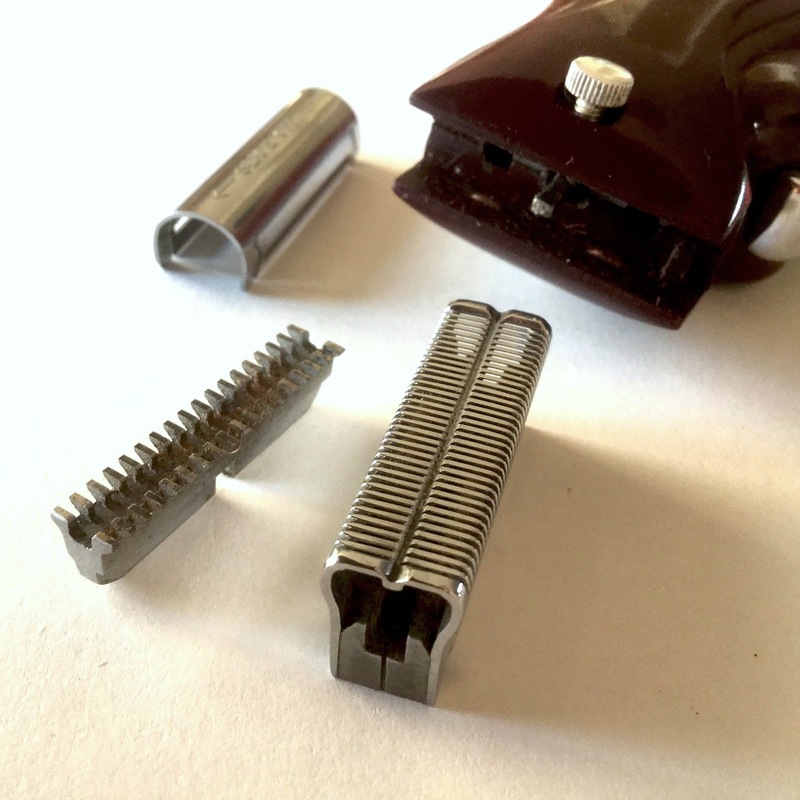 To properly clean everything (and being curious for its inner workings), the appliance comes apart fairly easily with the mechanism still together. The body shells washed clean (strong soap and toothbrush) and some of the old grease was removed from the innards. Lightly oiled, good to go! I have 2 of these, one KO17891 and KO33876, I have the earlier one in the car and used to use it on way to work, around a 40 minute drive, did take at least 20 minutes to get a perfect shave, but was achievable with time and patience. Until finding this page I thought it was a 1960's design. Oh.. Just noticed, the serial number doesn't seem to divulge age, the head on lower serial is 54, and higher 52. Unless they worn and replaced of course. Don't think anyone on the net has found rhyme or reason in Rolls serials; unlikely to have been incremental serials with my even higher serial made in '53. 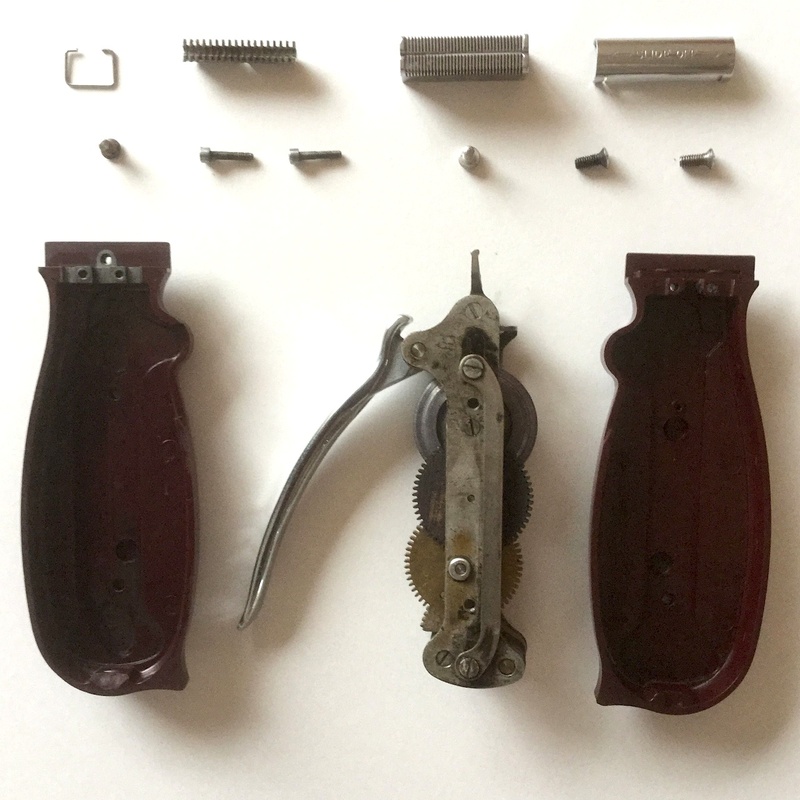 Been boot sale and picked up another, purple lined hard box with metal hinge and metal closing clip (that's quite interesting too). Other side has Pats Pending for 1937 and 1938. 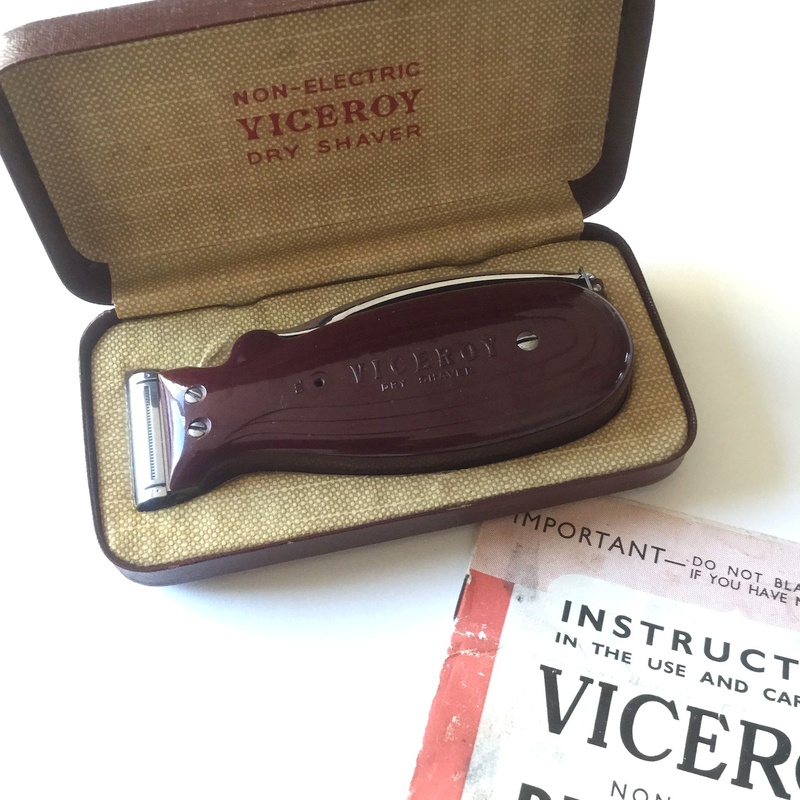 Rolls launched their non-electric and electric shavers in the fall of '39, so this will be a very early one. Perhaps even the launch-batch. It was of course a bad time to launch a metal-using luxury product - most were sold after the war. Interesting to hear that they changed shearing head design. Absolutely solid workmanship (as are their blade razors) - again congrats on your find! Hi, Robert, after a little research I can confirm the one I have was made in 1939, marked only with 2 UK patent numbers 15590-1937 and 579-1938, (both pending) US Patent 2104929,there is no maker marks on case. The cutter head is marked with same patent numbers and D39 and has to letter R back to back, is very different to the latter post war heads. Can do some photos if you wish to add. From images, their first head I think lacked the centre groove. The US patent has a very different head still, interesting design that. If you can upload/share images, would be interesting indeed. When Rolls launched their dry shaver in the Fall of '39, afaik they launched in Britain and in the US at the same time. Not sure how many (if any) were sold into the US though.